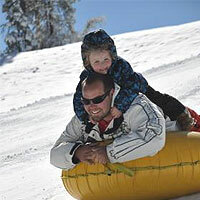 When it's cold, or when it snows, there is no better family fun than taking an inner tube and going down the hill. To make it even more exciting, you can race your friends and family, or just try and beat your own time record. You can sled, tube, saucer anywhere in the forest where there is a clearing, and it looks to be safe. But there are places that specialize in this, where the snow is groomed, and the runs are long and safe, and the fun is just yours to be had. Serviced by a moving uphill lift that eliminates the tiring uphill struggle through snow, Big Bear Snow Play is inner tubing at its finest. The lift-assisted uphill climbs for the inner tubing lets parents and children conserve their energy for the thrilling downhill twists and turns and not on walking uphill! The rides are fast and wild and there are plenty of different levels. We like to race each other! When Mother Nature cooperates the Big Bear Snow Play is a combination of man made and natural snow, groomed nightly for the best experience possible. There is also a warm lodge to sit back, have a hot cocoa and watch from the windows. Looking for a bobsled run? The Alpine Slide at Magic Mountain is open all year and is Southern California's only authentic bobsled experience. Begin with a scenic chairlift ride to the top. From there riders navigate their own individually controlled sleds, each with teflon runners and ball bearing wheels, down their choice of two quarter-mile long cement tracks filled with high-banked turns and long straightways. The bobsleds aren't on snow, but if you're looking for snow and tubing, they also have an area for old fashion tubing. Parents can join in the fun or enjoy soaking up the sun on the spacious lawn and two sun decks. The area's double water slide operates during the summer months, taking riders down two twisting and turning flumes filled with refreshing, cool water, before dumping them with a splash into the heated pool at the bottom. They also added go carts and mintaure golf for summer fun. For us... It's all about the snow.